This ‘Boho-Chic’ styled shoot was the epitome of crushing the notion that all brides MUST have a wedding with 200+ guests in a lavish, expensive venue costing hundreds of thousands of dollars in order to marry the love of their lives! With a bit of vision, style, and a beautiful backdrop – a popup elopement and/or very intimate wedding can take place just about anywhere! The beauty in it all is the realization that the beauty of the day is not based on the number of people in tow, but upon the meaning BEHIND it all – two people, coming together to take a vow – til death do them part. 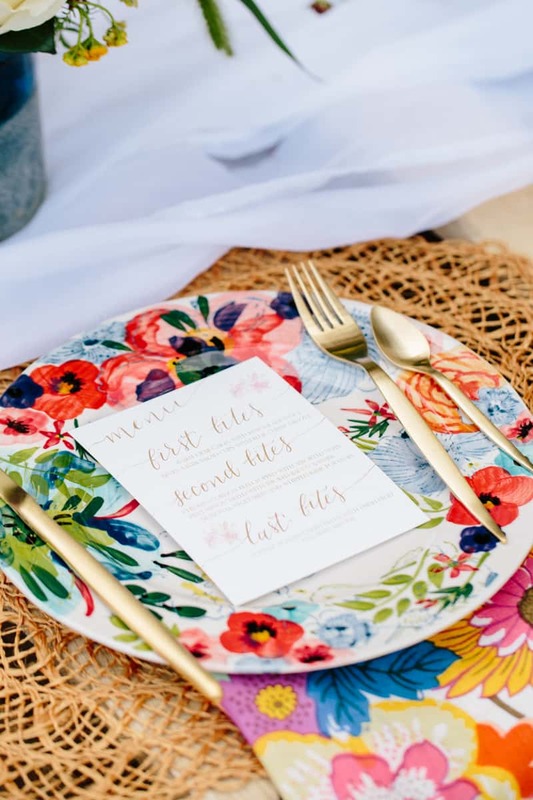 We decided to go alllllll the way boho/natural with this shoot – featuring very bold, colorful patterns mixed with a few feminine neutrals, as well – on the backdrop of a beautiful, intimate, beach. Doesn’t get much better than that! Some of the fun details include hand-lettered stationery (invitation suite & menu cards), bright & bold floral arrangements – including the teepee (yes, a teepee!) adornment, centerpieces, and bridal flowers, gold cutlery and rose-tinted glassware, his and her copper mugs, and the cutest little gift basket you ever did see (wouldn’t these be SO simple to make for a handful of your closest friends and family as a ‘Thank-You’?!).? To all of the beautiful brides out there – we love you, all! We love the totally over-the-top weddings in the fancy ballrooms and refined barns, BUT…it is also totally okay to decide not to be caught up on spending a ton with a lavish, expensive wedding with tons of guests and decide to, instead, choosing to focus your time and money to create a small piece of heaven and absolutely spoil a few of your closest family and friends with beautiful details and beautiful scenery. So bright, pretty and delightful. Thank you so much for the feature!!! <3 🙂 Best Day ever!! !